Video on Demand (VOD) training program updated in 2007 to accomodate Federal Motor Carrier administration regulations. 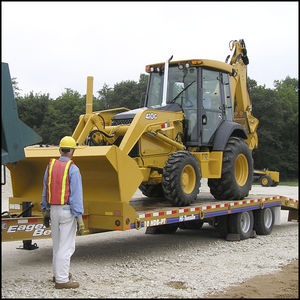 Addresses correct loading, tie-down, transport and unloading of different types of heavy equipment on all types of trailers including tag-alongs, detachable goose necks, beaver tail and fixed neck lowboys. Eighteen different types of equipment are addressed. Topics: Knowing the trailers rated capacity, The importance of correct trailer placement prior to loading, Snow, wet, muddy loading and unloading situations, Dangers of loading tracked equipment, Chain types and restricted use of tie-down chain. Each video lesson can be viewed more than once, over several days or months. When you have a solid understanding of the lessons and are done viewing, take final test and print a certificate of completion with your name and score. Designed for self-study, but can be projected during an instructor-led class (one time per purchase).